At the height of a sweltering afternoon in late July, more than a hundred people descended from a caravan of air-conditioned Blue Star buses onto Oregon Sen. Chuck Thomsen’s (R-Hood River) Hood River Valley orchard. They were there to tour several rows of modest labor housing nestled in a grove of pear trees on the senator’s family farm. The housing wasn’t impressive, but it wasn’t dilapidated either. Closer to the size of tool sheds than typical American homes, some of the tiny single-story housing units had satellite dishes protruding from their roofs and flowers planted at their stoops. Children’s toys and other evidence of family life dotted the courtyard, along with barbecues, bicycles and laundry suspended from makeshift clotheslines strung from one exterior wall to another. “We wouldn’t be where we are today without migrant labor from Mexico,” Thomsen told the group. His employees had no idea the tour was coming through that day, he said, so what they were seeing was unstaged. He encouraged his guests to ask the farmworkers to see inside their homes. As visitors wandered around snapping photos with smartphones and chatting among themselves, Thomsen’s employees and their children dodged between them, going about their business. 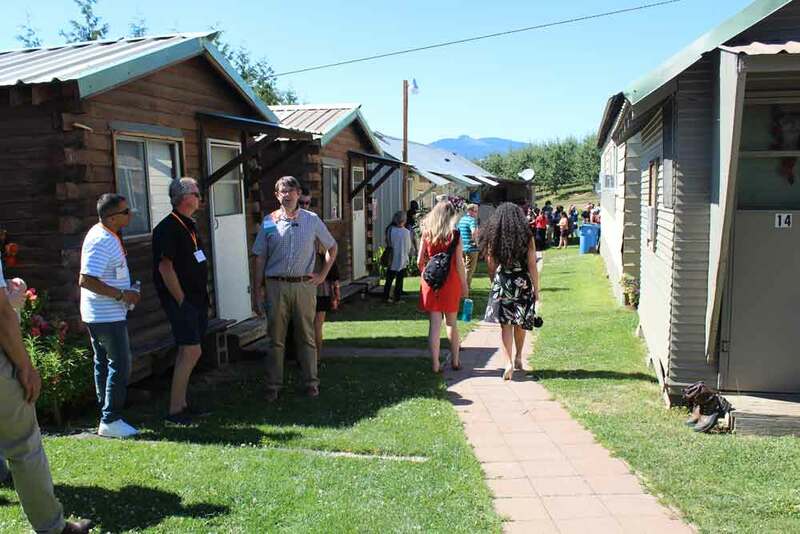 Thomsen had invited the enclave of government officials, growers, farmworker advocates and housing professionals to his property as part of CASA of Oregon’s annual Farmworker Housing Conference. The nonprofit was founded three decades ago to address the housing needs of Oregon’s farmworkers. Visitors tour homes at Thomsen Orchards as part of CASA of Oregons's 2018 Farmworker Housing Conference on July 25. Earlier that day at the Hood River Best Western, panelists and speakers discussed how America’s farmworkers are living in a constant state of fear under ramped-up immigration enforcement, while at the same time continuing to face economic hardship and housing difficulties that have persisted in their communities for decades. Farmworkers’ very existence is crucial to meeting one of humanity’s most basic needs for survival, but throughout U.S. history, they’ve received fewer rights, worse treatment and greater exposure to hazardous working conditions than people in most other occupations. While American workers have benefited from overtime pay and minimum wage laws under the Fair Labor Standards Act, for 80 years, farmworkers have continued to be excluded. The agricultural industry is also exempt from child labor laws. It’s only in Oregon’s fields that children as young as 9 can work legally, even when the farm is not owned by their guardians. Other states set the minimum work age in agriculture between 10 and 16, according to the U.S. Department of Labor. Despite massive labor movements and attempts to organize farmworkers, only piecemeal improvements to their living and working conditions have been made through the years. But America’s age-old practice of devaluing and exploiting this labor force has taken its toll, and now farmers are paying the price. With the decline in immigration from Latin America and the increase in job opportunities away from fields and orchards, far fewer laborers are seeking what’s readily acknowledged as grueling work for low pay on American farms. “We need to elevate the economic situation for farmworkers in this country, or else we’re not going to have agricultural workers,” said Arturo Rodriguez, who’s served as president of United Farm Workers since Cesar Chavez’s passing in 1993. He spoke with Street Roots in advance of visiting Hood River to give a keynote speech at the Farmworker Housing Conference on July 25. “We need to elevate the economic situation for farmworkers in this country, or else we’re not going to have agricultural workers,” said Arturo Rodriguez, who’s served as president of United Farm Workers since Cesar Chavez’s passing in 1993. He said that while farmworker families continue to be one of the lowest paid groups of workers, many agricultural centers, such as Oregon’s Willamette Valley and Napa Valley’s wine region, have become unaffordable. An ironic side effect of the federal government making life in the United States more difficult for immigrants is that farmers are being forced to make concessions that immigrant workers have been fighting for decades to achieve. In the past, farmers had a surplus of labor, so wages stayed low and working conditions didn’t improve. They could easily replace disgruntled workers. Now, said Rodriguez, because farmers have grown frustrated with leaving millions of dollars out in their fields because they don’t have bodies to harvest their crops, farmworkers are starting to see their wages and benefits increase as their employers compete for their labor. Some growers have reached out to Rodriguez’s union – a longtime adversary – in an attempt to learn how they can make conditions more desirable to workers, he said. “A lot of major growers are coming to us in confidence, saying, ‘look, we gotta figure out a better solution here,’” he said. Through collective bargaining and other programming, his union is helping growers find ways to improve working conditions for farmers and to ensure people being brought across the border as part of the federal guest-worker program are not being exploited by Mexican cartels – a growing problem. In June, United Farm Workers secured a contract through collective bargaining for the employees of one of the country’s largest vegetable producers, D’Arrigo Brothers. In a huge win for the farmworkers’ union, the California-based grower now offers fully paid health insurance to its employees and their families, as well as higher wages. On the West Coast, lawmakers have begun to pass legislation and adopt rules aimed at improving the lives of farmworkers as well. In 2016, California Gov. Jerry Brown signed into law a bill that included agricultural workers under minimum wage and overtime laws afforded under the Fair Labor Standards Act, making California the first, and still the only, state in the nation to grant overtime pay to farmworkers. When Oregon Legislature passed a bill to incremently increase the state's minimum wage in 2016, amendments to exclude farmworkers were proposed, but none were adopted. Additionally, when the U.S. Environmental Protection Agency updated its Agricultural Worker Protection Standard, Oregon Occupational Safety and Health Administration (OSHA), after a long and often contentious rulemaking process, passed pesticide protection laws more strict than the EPA’s for agriculture workers, taking effect in January, 2019 (see “After unprecedented input, Oregon OSHA adopts new farmworker protection standards” at news.streetroots.org). In recent years, Washington and California have passed regulations to combat heat-stress injuries among outdoor workers. To catalyze the heat-stress legislation in California, United Farm Workers elevated the death of 17-year-old Maria Isabel Vasquez Jimenez. She was two months pregnant and working in a vineyard near Stockton, Calif., in 2008 when she collapsed on the job in 95-degree heat with no access to water. Her employer put her in the back of a work van with no air conditioning. When she was finally taken to the hospital at the end of the workday, her body temperature had reached 108 degrees and she was in a coma. She died two days later. California’s heat-stress law, requiring that workers have access to water and shade among other provisions, has made a tangible difference, Rodriguez said. Now, when he drives along Highway 99 through the agriculturally-rich San Joaquin Valley, he sees trailer sites where farmworkers are able to sit on chairs around tables in the shade to eat their lunch and drink water. A vast improvement from sitting on the ground, he said. Additionally, he said, safety inspections are up and heat-related deaths are down. Through educational efforts, workers know the signs of heat stress and they know their employers are required to provide access to drinkable water and medical assistance in cases of injury. While California hasn’t seen a heat-related death among farmworkers so far this season, United Farm Workers is examining recent heat-caused fatalities on farms in Georgia and Arizona. Since last summer, Oregon OSHA has been collecting data related to heat-stress violations and injuries as part of its “heat stress emphasis program,” said the agency’s spokesperson, Aaron Corvin. Since the program started, OSHA has issued 317 violations to Oregon employers during the course of heat-emphasis inspections. Of those, 38 violations were on farms. That’s not counting any violations that may stem from the agency’s nearly 80 open investigations so far this summer. Of the farms that were inspected, 64 percent were in compliance. Portland-based Northwest Workers’ Justice Project, which provides legal resources to immigrant workers in the region, has convened a coalition charged with improving standards for low-wage workers across the state. This coalition, Safe Jobs Oregon, is hoping Oregon OSHA will create new heat-stress regulations at the end of its data collection this fall, said the coalition’s coordinator, attorney Kate Suisman. “At that point, if they don’t decide to make their own rule, we and a few other groups will petition for rulemaking,” she said. While undocumented workers and guest workers are able to file workers compensation claims and collect benefits when they are injured on the job, Suisman said they typically don’t seek compensation. While the labor housing on Thomsen’s orchard may be a bit cramped, the senator said he offers it to his workers free of charge. Oregon farmworkers who are left to find their own housing often find few options when they enter local rental markets. A recent survey of 310 farmworkers across six regions of Oregon revealed that in addition to challenges related to immigration status, lack of rental history and language barriers, farmworkers are faced with being priced out of Oregon’s tight rental markets given their low wages, according to a report from Oregon Housing and Community Services released in January. “These conditions are exacerbated during peak harvest seasons. Many Farmworkers are forced to share crowded housing conditions because of cost and lack of options. Farmworkers are sharing homes or apartments with other families. Many rely on hotels, garages, and live three or four people to a room. Farmworkers have moved away from areas with agricultural work for lack of housing options,” stated the report. When the agency’s director, Margaret Salazar, spoke about these findings at the Farmworker Housing Conference, she said in Oregon, the lack of affordable housing is contributing to farm labor shortages. Increased U.S. Immigration and Customs Enforcement raids aren’t helping either. Ramón Ramírez, former director of Oregon’s farmworker union, Pineros y Campesinos Unidos del Noroeste (PCUN), called the labor shortage and U.S. immigration policies a potential threat to national security when he spoke at the conference. He pointed to the early 2017 ICE raid in Woodburn, which is home to many farmworkers, and ICE’s employment verification audit of Canby’s Kendal Floral as drivers of fear among Oregon’s agricultural employees. Federal immigration policy is affecting every link in the food chain, said Ramírez, from growers and pickers to grocers and restaurants. “When we put the food supply in our country in danger, that is a national security question,” Ramírez said. If Oregon voters pass Measure 105 this November, effectively repealing the state’s sanctuary status law that prevents local law enforcement from using resources to enforce federal immigration laws, it will likely exacerbate farm labor shortages across the state. Since the time of Cesar Chavez’s leadership, fear and uncertainty permeating immigrant communities has forced an evolution in United Farm Workers’ advocacy strategies, said Rodriguez. Rodriguez said that inevitably, anytime farmworker unions attempt to improve the situation for farmworkers in California, Oregon or Washington, employers argue that any changes will be too expensive and will destroy the industry. The impact on food costs to consumers has been a popular argument against raising wages for farmworkers over the years, but Rodriguez said that’s a myth that’s been disproven with numerous studies. All you really have to do is look at the numbers, he said. An average strawberry picker, for example, will pick about 100 flats of berries a day, with 12 pints in each flat. In season, assuming each pint sells for about $3, that’s $3,600 retail, explained Rodriguez. What the worker is paid for each pint is nothing compare to the retail price consumers pay, he said. Agriculture labor economist Philip Martin told the National Geographic in 2016 that if farmworker wages were raised to match a $15-an-hour minimum wage, the average American shopper would pay just $20 more per year. In Oregon, however, the rising minimum wage is still not enough to afford a one-bedroom apartment in 31 of the state's 36 counties, according to a 2018 report from the National Low Income Housing Coalition. 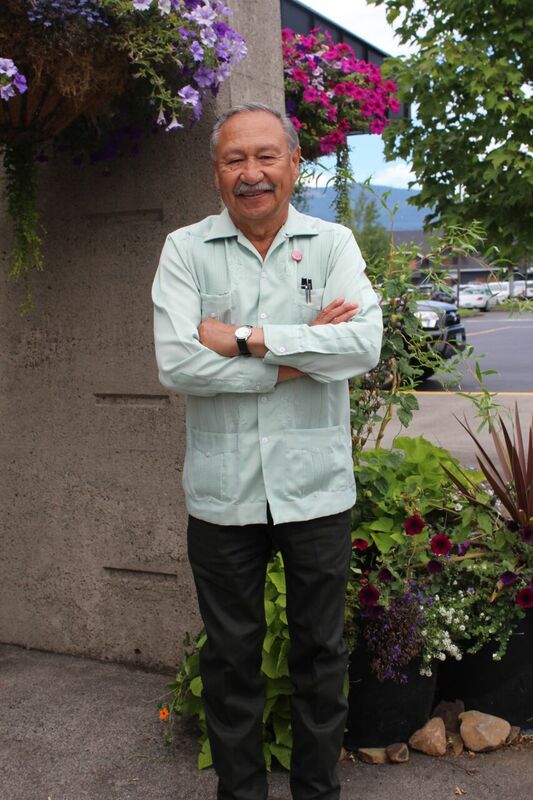 You can read the full interview with United Farm Workers President Arturo Rodriguez here.